I’m a milk-sweet fiend. I prefer milk-based sweets, mostly bengali sweets and sweets that are creamy and nice 😀 Although I do love the occasional gulab jamoon and jalebis, I’d any day pick a sweet that is creamy and yummy over something that isn’t. Halwas are an exception to this rule. 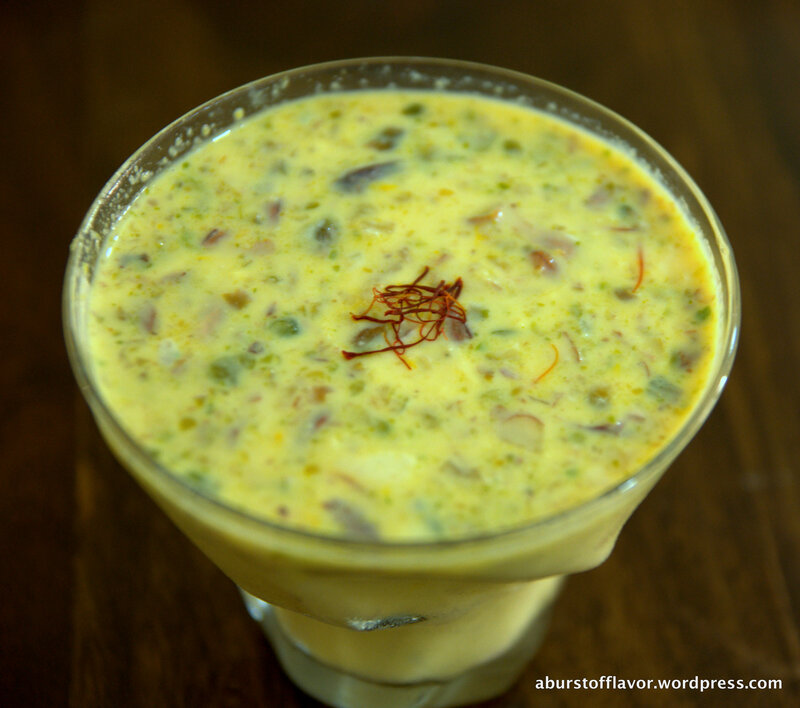 I made this delicious Basundhi – which is a creamy milk-pudding kind of sweet (generally served cold) for our very first wedding anniversary. This was incidentally my first time making it, and it turned out superb tasting! I was happy because it was creamy but light, not too sugary, had just the right amount of sweetness, and a greenish-yellow colour from the pistachios and saffron. Try this once – it is remarkably simple, though a little time consuming. You will love the end result ! Crush the pistachios and almonds together with a mortar and pestle coarsely. 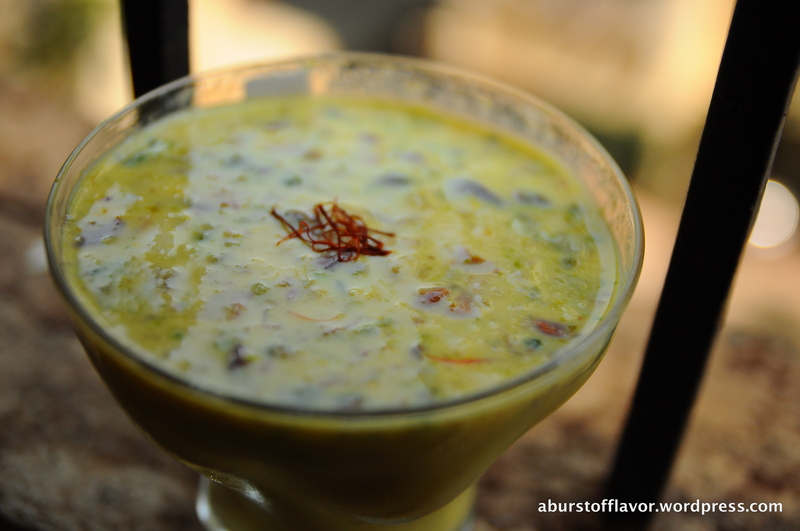 Add the saffron strands to a few drops of warm milk in a cup and mix lightly with a spoon. Set aside. Boil milk on a medium-low flame in a heavy-bottomed pan. When it is just about to reach boiling point, add the sugar and reduce the flame to low. Now simmer the milk, stirring at every 2-3 minute intervals. Scrape the sides of the vessel regularly and add back to the milk mixture; this will make the basundhi creamier. Let the milk reduce to about half of its original quantity; this will take between 20 and 25 minutes. Now add the saffron soaked in milk and cardamom powder. Add the condensed milk at this point and give it a stir. Add the crushed nuts and mix gently. 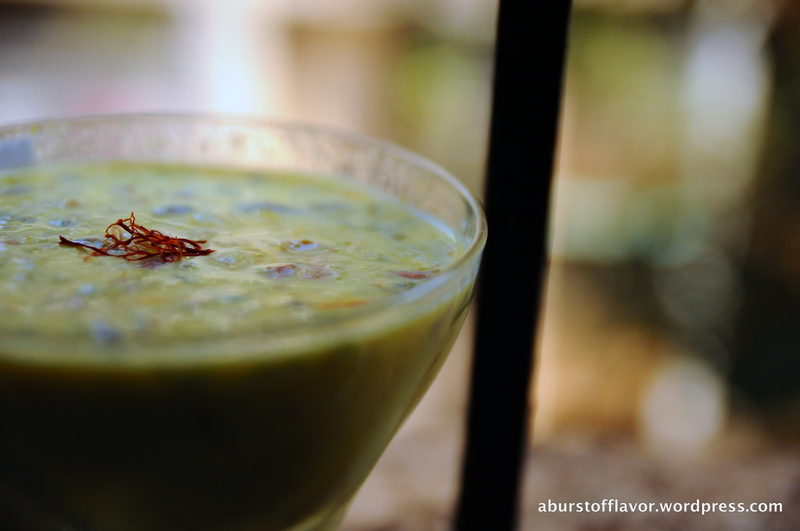 Transfer the basundhi to the refrigerator (covered) and let it chill for 1 to 2 hours. Serve cold in cups or glasses.